“Over the Christmas season, we invited local Muslim friends into St Mary’s Cathedral to join us for the Feast of the Epiphany – we often get similar invitations to join them for their own festivals. In the course of our celebrations of the birth of the Saviour, we listened with interest to the story that Muslims tell of the annunciation of Jesus in the Qur’an. Such readings have happened a number of times in the past in this and in other churches and have led to deepening friendships locally, to greater awareness of the things we hold in common and to dialogue about the ways in which we differ. St Mary’s Cathedral has received received a number of offensive messages. These have been reported to Police Scotland. We are grateful to Police Scotland for their support at this time. Confirmation is something that has changed in recent years significantly. At one time everyone knew what confirmation was. It was an unambiguous sacrament. It was the means by which young people at a particular age (never entirely decided upon) came into the full sacramental life of the church. By being confirmed they were confirming the vows that had been made on their behalf when they were young children and were thus deemed ready to receive communion for the first time. Although some adults were always confirmed they tended to be the exception rather than the rule. Nowadays, confirmations still happen throughout the year in every diocese but this has become something of a pastoral sacrament and means different things to different people. It is still undoubtedly the case that some young people are confirmed as part of their journey into the communicant life of the church. However for some years now, canon law has been very clear indeed that anyone who is baptised is welcome to receive communion in all the congregations of the Scottish Episcopal Church and so the focus on being confirmed in order to be a communicant has lost its focus. Sometimes people are confirmed as part of their journey into the Scottish Episcopal Church (or indeed into the Anglicanism of which we are but a part) from a different denomination. For them it is a way of recognising that they have found a place within this tradition and confirmation is a sacramental way of speaking of the deep reality of finding themselves at home. The number of adults in society who have never been either confirmed or baptised is increasing as children are no longer baptised as a matter of course. When people discover the Christian faith for the first time as adults, then baptism and confirmation (which might be administered in the same service) are a particularly joyful stepping stone on their religious journey of faith. The different ways in which confirmation happens within our churches have led to some confusion. Some people don’t believe that confirmation still exists when that is very obviously not true. The liturgy itself has the rather complex, and some would say clumsy title: “Affirmation of Holy Baptism for Confirmation and Renewal”. Such has been the confusion about confirmation that it has sometimes slightly cynically been referred to in recent years as a sacrament in search of a theology. However, it is important to reinforce the fact that confirmations still take place and are still deeply significant life events for those who are confirmed. Confirmation in the Episcopal/Anglican tradition is almost always something that is carried out by a bishop. People within our tradition are sometimes surprised to discover that this is not universally so amongst the Christian churches. Our friends in the Church of Sweden often experience Confirmation as something that school groups are prepared for and which is administered by the local priest. A similar pattern is also common amongst Roman Catholic congregations here in Scotland. At its heart, confirmation is a very simple thing. It is a public declaration that one belongs to the church followed by prayers from the bishop who prays them whilst laying hands on the head of the candidate. Fill them with the joy of your presence. the spirit of wonder and true holiness. Do I need to be confirmed in order to receive communion? No, no – and a thousand times no. Canon law in the Scottish Episcopal Church could not be clearer. You do not need to be confirmed in order to receive communion. I was confirmed at a time in my life when it didn’t mean much to me – can I be confirmed again? This is a sacrament that the church thinks of as taking place once in someone’s life – though the effects go on for a lifetime. No-one should presume that confirmation was insignificant if they are currently looking to reaffirm their faith in public once more. Should that be the case, elements of the confirmation service can be used to make a fresh affirmation of faith in public. Do I have to be confirmed at all? There are some roles in the church for which confirmation is required however they are diminishing. 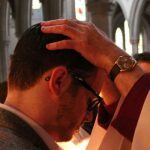 It is still the case that people need to be confirmed in order to be considered for ordination but it isn’t entirely clear why that should be the case. The requirement that General Synod Members should have been confirmed is being removed. Until very recently being confirmed was supposedly a requirement before one could be a bell-ringer at St Mary’s however this is no longer the case. The church is open at service times and from 10am to 12.30pm daily. The church is open at service times.